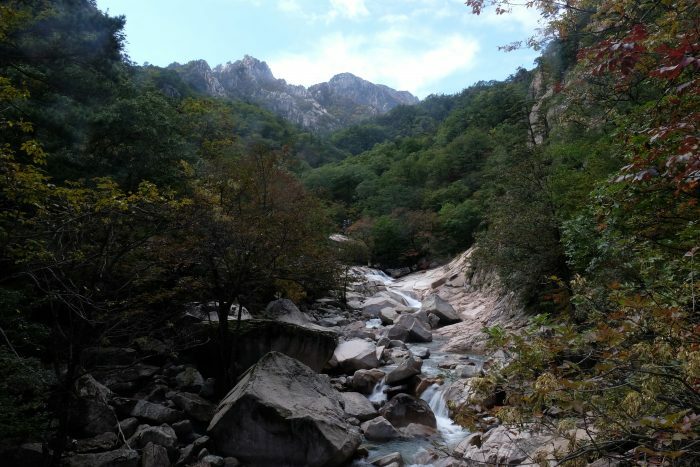 I spent two full days hiking in Seoraksan National Park, exploring four different areas from the entrance near Sokcho. On my first day, I took the bus into the park from my hotel around 9am. There is just one way into the park, and it is a dead end, so the bus didn’t get too far before hitting traffic. Walking might actually be just as fast if you are staying near the entrance to Seoraksan National Park. After paying 3500 won to enter the park, I headed for the first of my two destinations for the day, a hike to Biseondae. The entrance area to Seoraksan is tourist hell, with thousands of people gathering before they set off on their hikes. 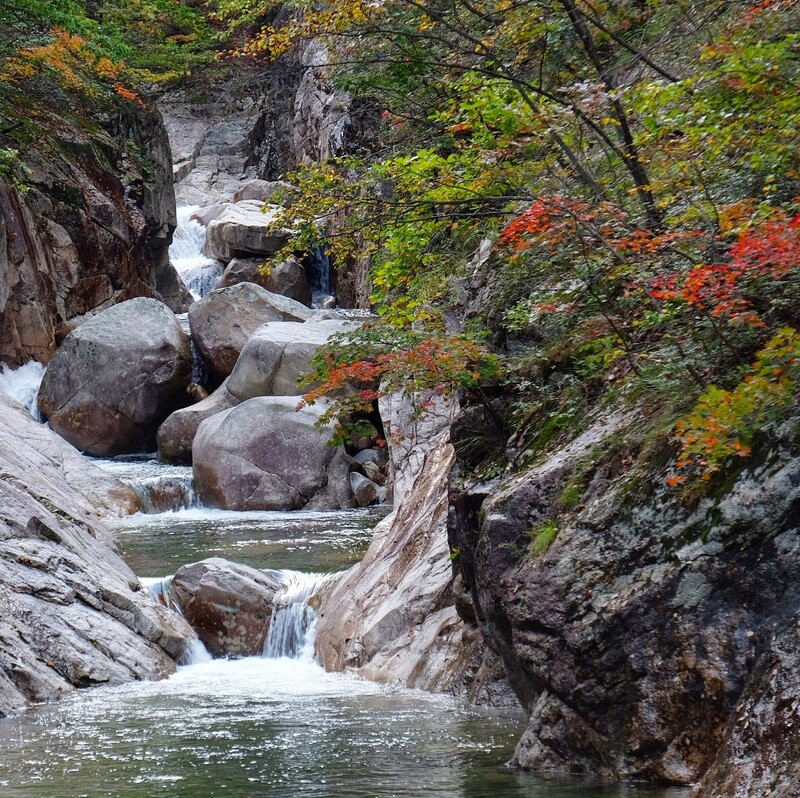 Fortunately, there are several different directions to head in, which helps to thin the crowds somewhat, though if you’re looking for a tranquil hiking experience, don’t go to Seoraksan National Park during the fall. That said, there is a reason why there are so many people here in October. The mountains are beautiful in any season, but they come to life with fire as the leaves begin to change color. I was there near the earlier part of autumn, so the colors weren’t at their peak, but it was still busy. Later in the day, I spoke with another hiker who says that around 100,000 people pack into Seoraksan National Park when the changing leaves are at their best, generally around October 20th. 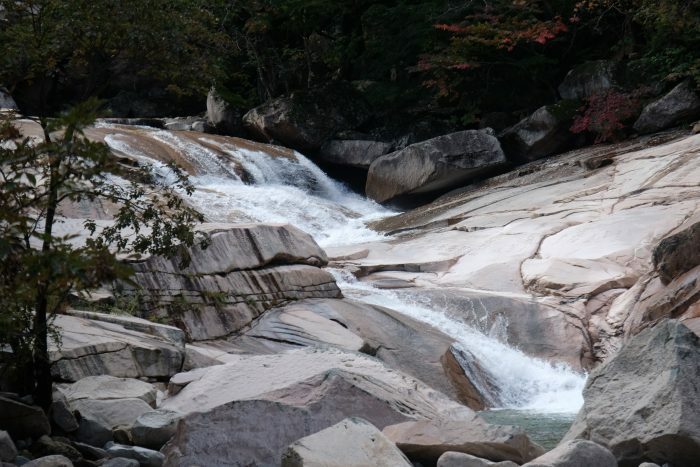 If you are interested in visiting Seoraksan National Park on a tour, here are some options. 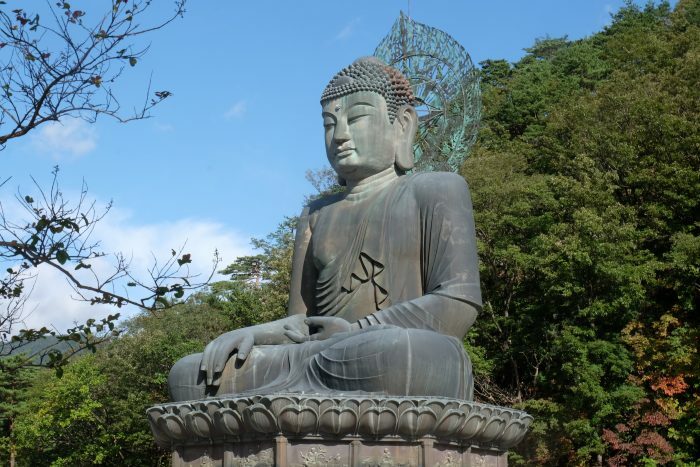 On my way toward the start of the trail to Biseondae, I passed this giant metal Buddha. Just past this was Sinheungsa Temple, which I decided to save for the next day as it was also down the path to Heundeulbawi Rock, grotto, & Ulsanbawi Rock. 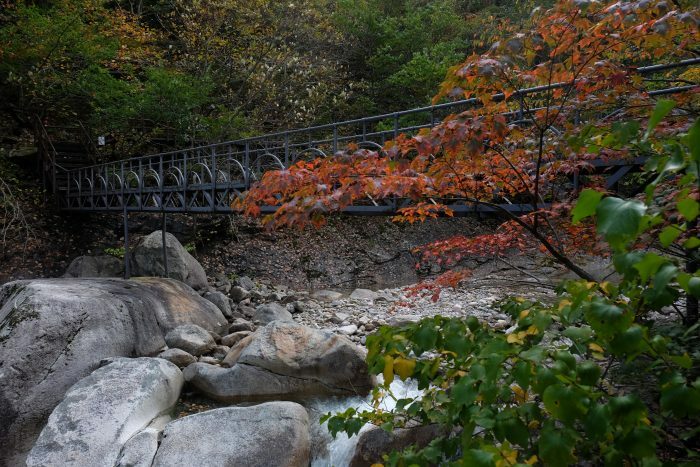 The hiking trail to Biseondae is one of the more moderate trails you can take from the entrance area of Seoraksan National Park. This section of the trail to the rock is 3.0 kilometers, at a 6.3% grade. The trail follows a river, so aside from a few bridges & cliffs, it’s a consistent climb. The first part of this trail to Biseondae is a paved path with a very gradual incline. There are trees all around. It’s beautiful, provided you can get past the fact that on a busy autumn day, it’s filled with shouting people. People hike for different reasons. Like most people, I enjoy experiencing the tranquility of nature & getting away from it all. I like taking photos and hearing rushing water & chirping birds. Some people hike for other reasons. 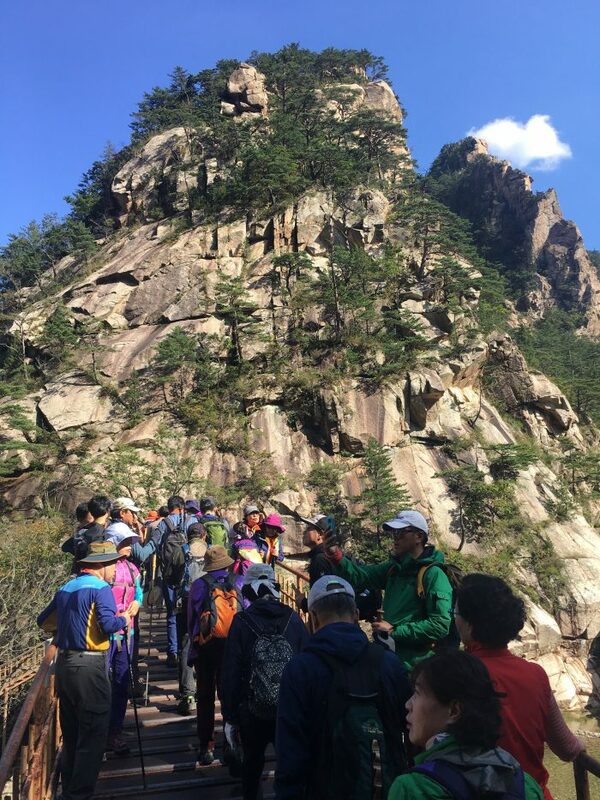 One thing I noticed at Seoraksan National Park was that hiking is very much a group activity in South Korea. There were many large groups, accompanied by the sort of shouting that happens when you get a lot of people together. Not only were some people shouting, some of the groups were also moving quickly, as if there was a competition to get up and down the trails. Several times I stopped for photos by the river so I could let a large group pass and get further away from me. Despite all the people around, everyone does get a bit more spread out as you move further along the trail to Biseondae. 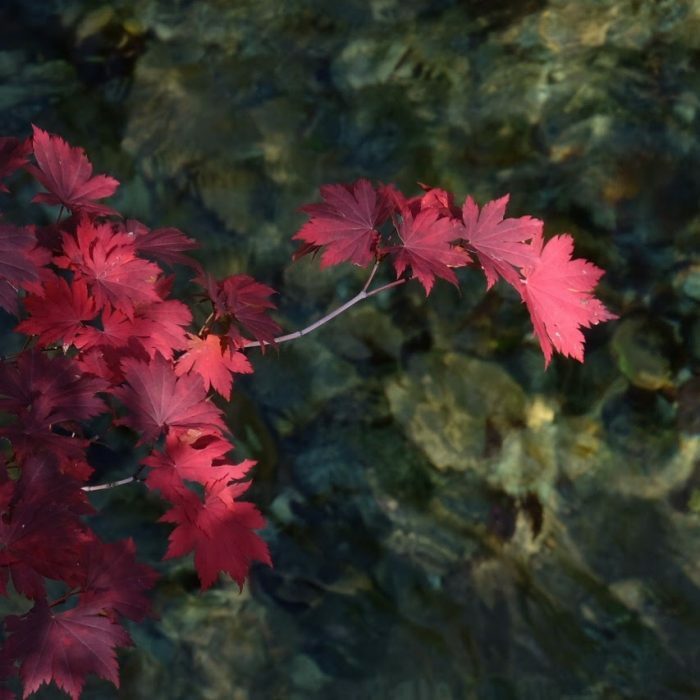 It had been particularly warm in South Korea in mid-late September, so despite it being October 8th, only some of the trees were starting to see their leaves change. Still, this is a beautiful place. After crossing a bridge, the trail gets a bit steeper and rockier, though nothing too bad. There were a few more trees bearing yellow leaves. 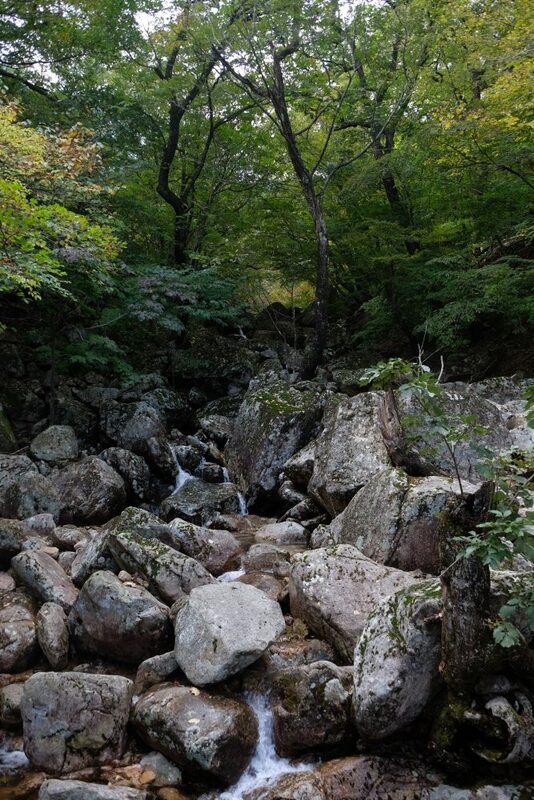 Despite this being at the beginning of the dry season in South Korea, the past summer’s rain plus the typhoon that had hit when I was in Busan made the small river flow in spectacular fashion below. Just before the final parts of the hike to Biseondae, the trail begins to get steeper. The rocks are very smooth, smooth enough to be slippery even when dry, so be careful. Lots of people on the trail use walking sticks, and I wished that I’d thought about getting one. There is a bridge crossing just before you reach Biseondae. 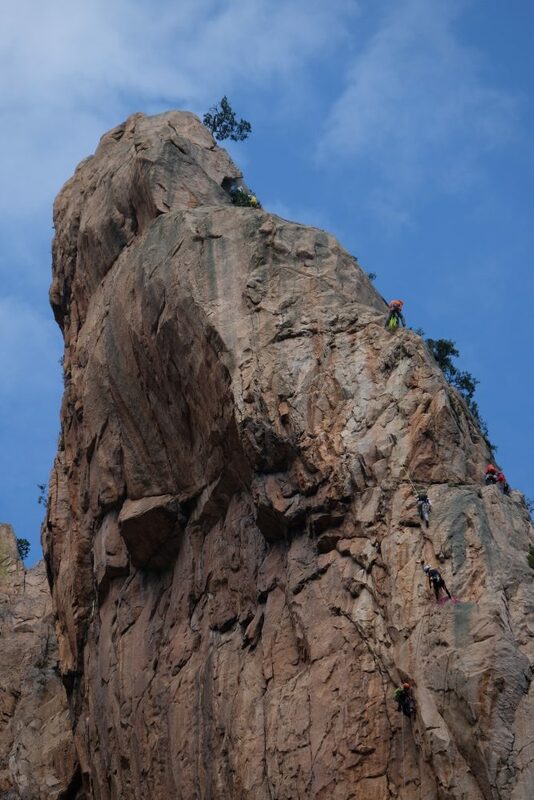 If you look up, you can see rock climbers above you. This is Biseondae. If you want to actually get up there, you’ll have to be much more adventurous. As for me, I was content to marvel up at it from below. 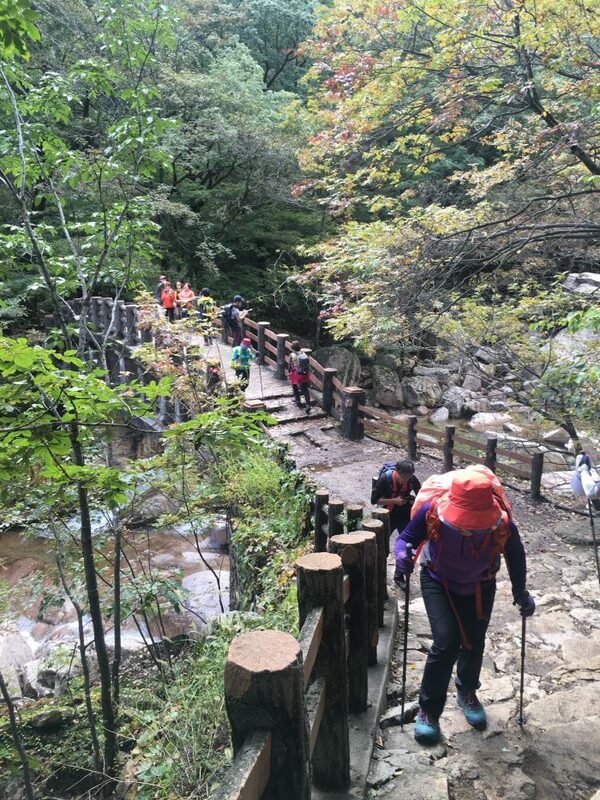 Going over another bridge that then becomes an elevated platform, you’ll have an even better view of the two pinnacles of Biseondae. 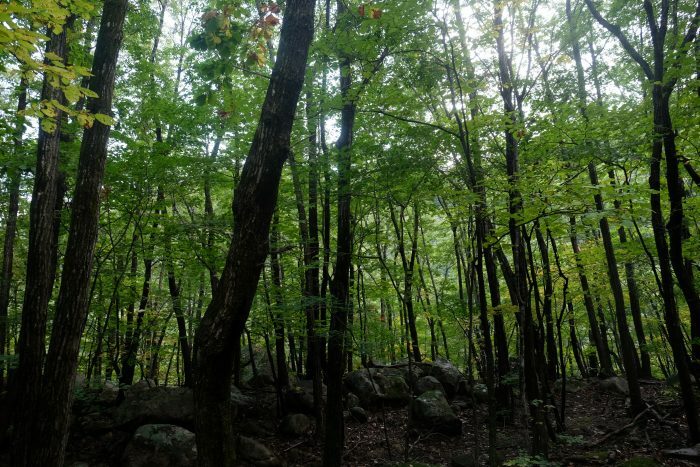 As you continue the hike, you’ll see more of it from a distance. You’d never get me up there, but the rock formation is cool to look at. The trail then crosses another big bridge. This bridge has holes in it that “allow” or “force” you to look down to the river below, depending on your perspective. So much for me staying firmly on stable ground. At this point, you have two options. One path goes toward Geumganggul Cave, down a trail that is only 0.6km but is very steep & more dangerous. 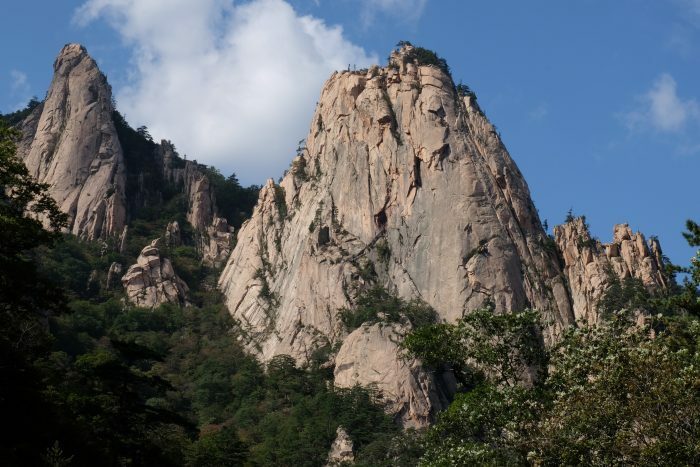 The other direction contains the main trail that heads much deeper into Seoraksan National Park. The full trail map is quite extensive. There are many more possible loops. 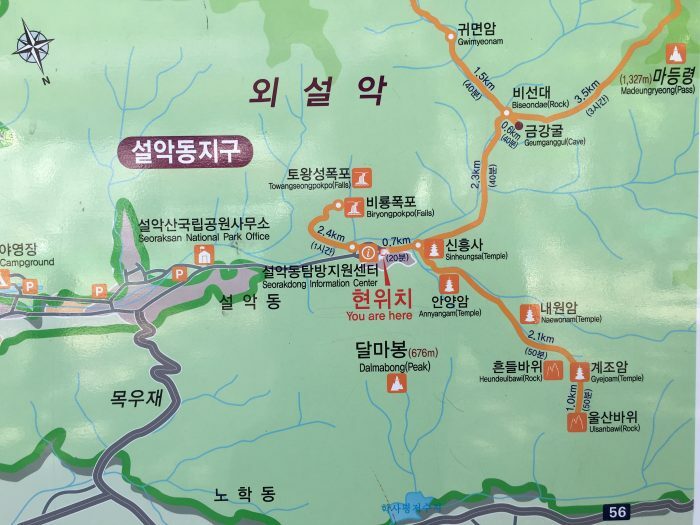 This map only shows the small area of the park I was able to explore during my two days, including the Biseondae, Biryongpokpo, and Ulsanbawi trails. I knew I would need to head back at some point, but I decided to follow this next stretch of the trail toward Yangpok Shelter. Yangpok Shelter is 3.5 kilometers away up a an 18.3% grade, making it a bit more difficult than the rest of the trail to Biseondae. Not many hikers go past the bridges here, so the trails are much quieter. There were some rocky paths, but also lots of bridges & level walkways over the river, making for great walking as well as spots to take photos without trees in the way. The higher I climbed, the more the leaves were changing. Skittish little squirrels refused to be photographed. 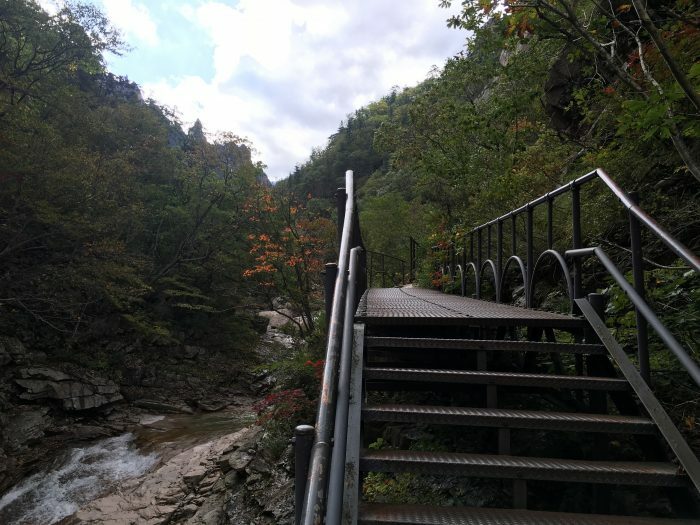 I continued past Gwimyeonam Rock for a little bit, then reached a stone staircase. I realized that by this point I had been on the trail for about 3 hours and it was 12:30pm. If I continued on, I might be getting a bit too close to dark for my liking on the return, so I turned back. There is so much more of Seoraksan National Park beyond this point. These trails are for hikers who are looking for overnight journeys, full-day treks that started earlier in the day, or for those who want to race through nature without enjoying it. I had stopped and taken so many photos on the way that it had slowed down my pace. This how packed the Biseondae bridge was when I returned to it. On my way back I was stopped by a man who wanted to chat. He was hiking by himself as well, and he wanted to take a break. He had lived in the United States for a time. We stood on a bridge sharing his cookies while we talked. It was around 2pm by this point. I made it back down to the entrance area of the park around 2:45, having walked over 8 miles so far that day. I wasn’t done yet. 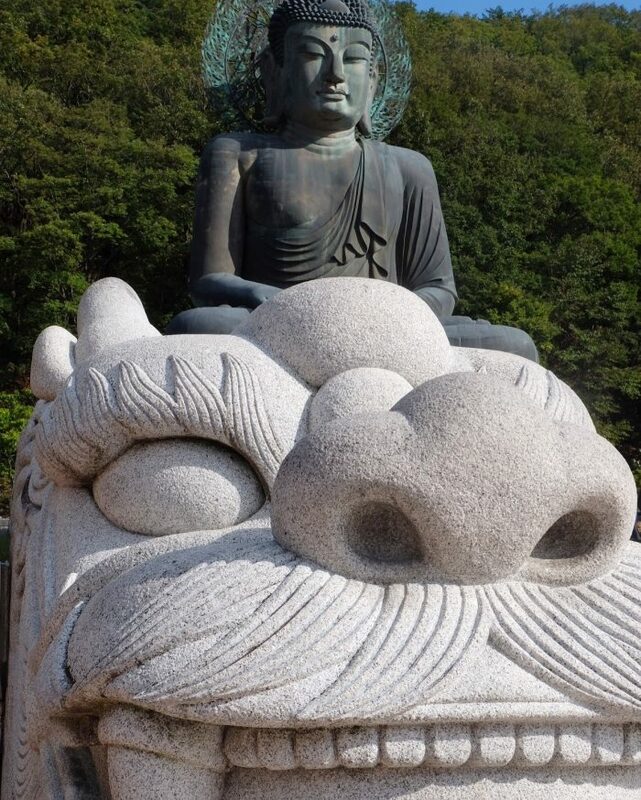 My next stop was to take the cable car up the mountain to the trail that leads to Gwongeumseong Fortress. 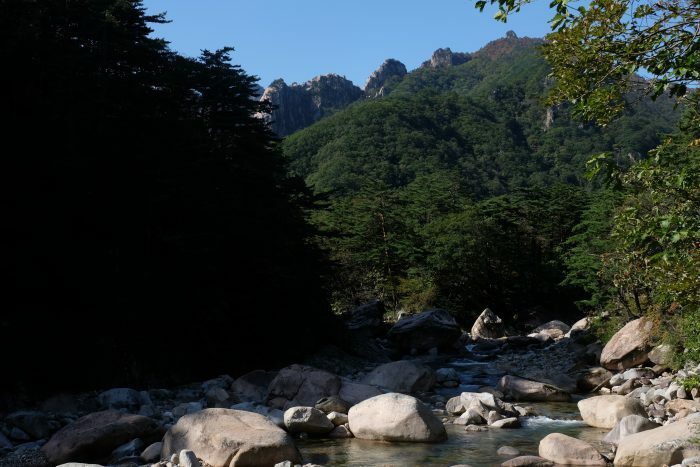 Seoraksan National Park is one of the most beautiful places in South Korea. 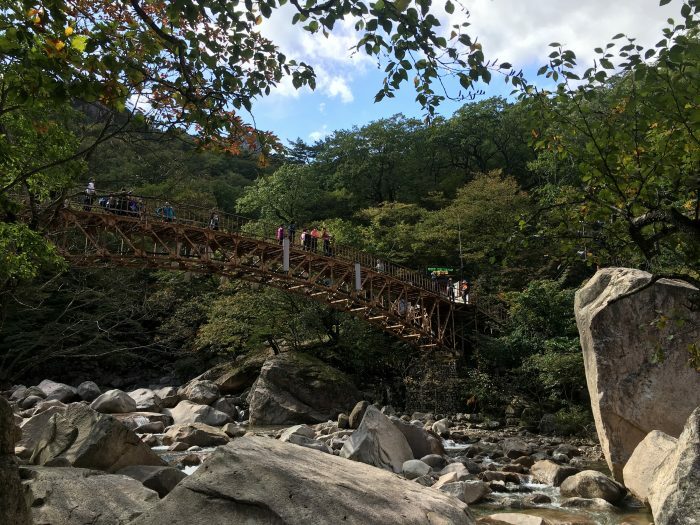 The Biseondae hike is a nice showcase of everything the park has to offer, especially during the autumn as the leaves are beginning to change. 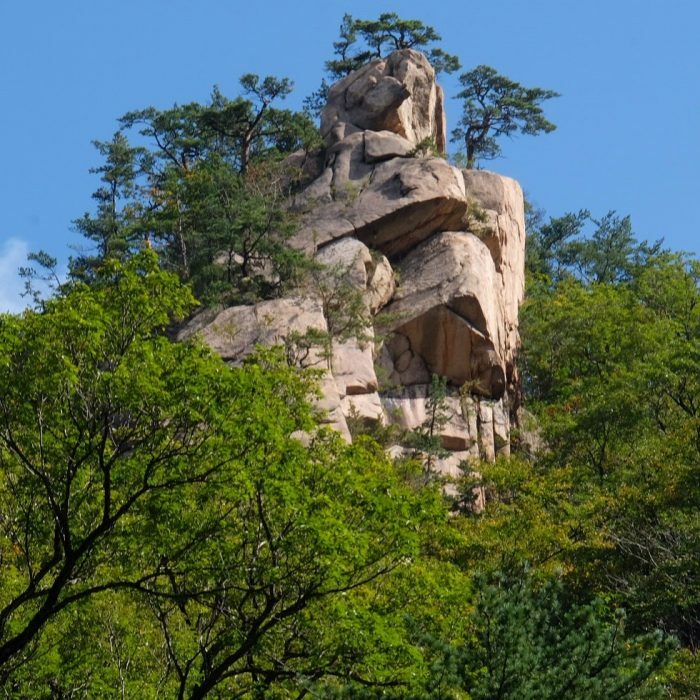 The rock formations are unique, and the clear water & air are a welcome break from some of the other environments one might encounter in South Korea. While I spent much of my trip in cities, it’s wonderful that there is a place with such natural beauty so close to Seoul.